This was my first EVER Mac Lipstick which I was given a few months ago! 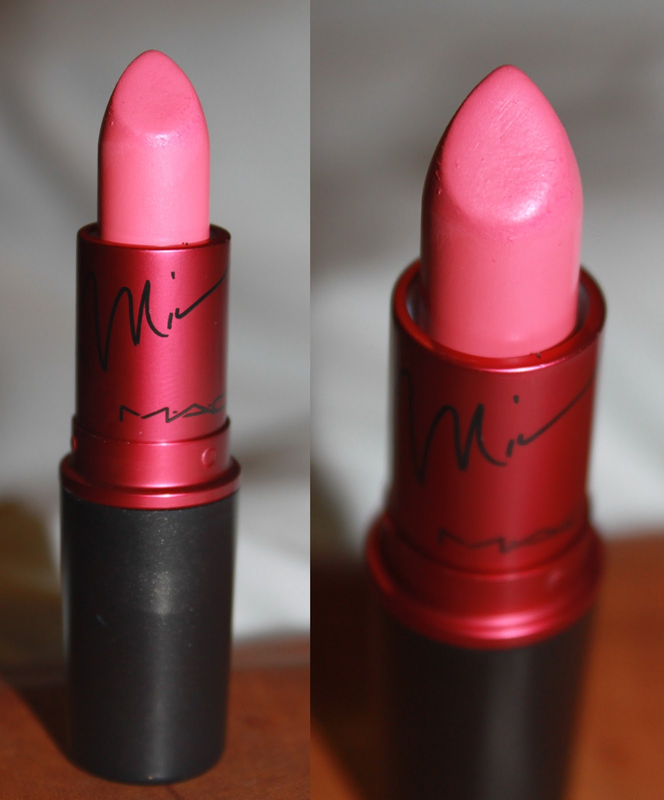 I was really excited to try this out, and to make it even better it's Nicki Minaj's shade! As soon as I opened it I was overwhelmed by the big bold pink. I was really unsure if I was going to ever wear it. After a few tries, I dared myself to go to college wearing it, and I did. I felt so good. As 'Barbie Pink' as this looks, it somehow suited me. I'm not exactly the typical girl either, so I was so surprised that it looked half decent! This cute little lipstick is a satin finish, so it's almost matte with a slight shine to it. I love how gorgeously creamy this feels on the lips too, despite how dry and flaky they appear at the moment. Some people have said that it appears dry on the lips, but as you can see on the photo below, it looks super creamy on me. It's packed with pigment so you are sure to get an amazing coverage with this baby. This lipstick appears really pink, but I sometimes see coral tones to it too. The only down side to this is when I try and take it off it seems to leave a weird pink/orange stain. I can't work out if it's the product or my dry lips! It's still available online and in store, so try it out before you purchase! You can purchase online at Debenhams for £14. For anyone who is a typical girly girl and likes their pinks, why not pop into store and see how this looks. Let me know in the comments what you think of this bold colour and if you've ever tried it before! Thanks for reading! Thank you!! It is pretty bold, but I really loved wearing it. It's nice to have a shade that really defines you from the crowd! oh now i want this one so bad :D!!! i've been eyeing it for a while already but i haven't really seen it "in action" before. it looks so pretty on you so now i want it to be mine ASAP :D!! Haha!! It's sooo pretty! Pick it up now, you wont regret it! ;) Let me know if you do! Im surprised I liked this, but you pull it off with aplomb. You look gorgeous in every colour you've ever tried on. I'm a lucky guy. This pink was SO electric! Love it on you! I want to try out this years Nicki Minaj which is more of a muted lavender but I keep talking myself out of it because I would hardly ever wear it! Wow, beautiful colours and your lips look lush! Shame it's Nicki Minaj though!